Toyota, the world's second largest vehicle manufacturer, has announced that it is to start production of a Camry Hybrid model in Australia and Thailand as part of its on-going efforts to develop worldwide interest in their unpopular hybrid vehicles. Hybrid vehicles, using petrol rather than diesel, are seen by Next Car's editor, Stephen Walker, as a wasted opportunity. Efficient diesels, such as those powering Mercedes-Benz, Peugeot, Renault and Volkswagen vehicles, amongst others, are saving Australians money at the bowsers and are reducing the CO2 burden on our environment. "The overly expensive hybrids are unpopular for numerous reasons ..... firstly, they were quite unattractive when first introduced, secondly, they have little or no demand second-hand and, thirdly, the unknown expense of replacement batteries down the line makes ownership uncompetitive. But the real problem with current Japanese hybrid vehicles is the fact that they still use petrol. The Europeans discovered years ago that the way to cut fuel consumption and emissions was to use diesel engines. And history is on the side of the Europeans who have proven, quite conclusively, that performance and economy can co-exist. The idea of a petrol hybrid is in the past and technology has left petrol hybrids in the past. If Toyota wants to look to the future they need to study Volkswagen's twin-charger system" our Editor indicated. 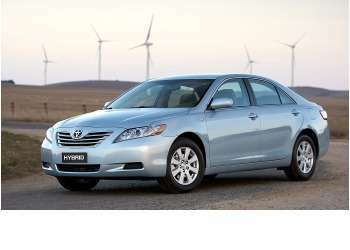 In Australia, the new Camry Hybrid will be going into production in 2010 at Toyota Motor Corporation Australia’s Altona factory in Melbourne, with an annual target of 10,000 units. In Thailand, the centre for production is Toyota Motor Thailand’s (TMT) Gateway Plant, where the aim is for 9,000 vehicles to be built each year from 2009. The conference was attended by members of the Australian Government, including Prime Minister Kevin Rudd. Ever since the introduction, in 1997, of the Toyota Prius – the world's first mass-produced petrol-electric hybrid vehicle – Toyota has been making a concerted effort to promote and popularise hybrid technology, as part of its high-priority environmental-management policy. However, these efforts have shown little success, to date. Australian taxpayers, for better or worse, have contributed some $35,000,000 to Toyota because of their decision to manufacture the Camry Hybrid in Australia. Additionally, the Victorian State Government, has contributed an unspecified contribution to Toyota's shareholders. Taxpayers will be left scratching their collective heads on this one. During the "Howard" years, taxpayers got used to what many would see as a bit of funny business. Now, it seems, history will just repeat itself. Our editor, Stephen Walker believes Australian Prime Minister Kevin Rudd, has backed a 'dud' with this cash giveaway. Walker claims "if any car maker believes a petrol hybrid is wanted in the market, then let their own cash be put at risk. If, and it is a big 'if', there is a queue forming, then they will make a fortune." Products: Samrong – Hilux, Fortuner; Gateway – Camry, Corolla, Soluna, Vios, Wish, Yaris; Ban Pho – Hilux.